I was so happy to read the nice words that Peanut Butter and Pickles wrote about Juno Baby's DVD, Juno's Rhythm Adventure. As much as I hate to admit this, I was actually so thrilled that someone noticed the book like packaging. We've gotten a few questions about our free iTunes downloads. If anyone is interested in three free songs, you can get the code by signing up on the Juno Baby mailing list. I've cut and pasted the full review below! Thank you Peanut Butter and PIckles! Music and kids go together like peanut butter and jelly (or peanut butter and pickles!). I was really pumped to get this DVD from Juno Baby in the mail for my daughter to watch. We've watched our Baby Einstein DVD's to death, and I was looking forward to trying something new. The DVD comes in this really cute book-like case, and inside the cover is the DVD and a spot to put another CD you make yourself with a free music download code from their site. A great bonus, if your kids like to listen to music in the car. 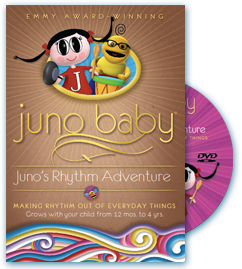 My daughter (she's three) LOVED the Juno's Rhythm Adventure DVD that we were given. She wanted to watch it again right away and did not budge off of my lap the whole time. We talked about if afterward and her favorite characters were Juno, and the "silly pink bunny". I liked the use of puppets instead of animation, and the use of original music from creator and composerBelinda Takahashi. The segments were short enough to keep my daughter's attention, and were colorful and whimsical. The songs promoted positive things such as walking and running and enjoying your friends. I also like that the DVD is also playable in French and Spanish. Watching something simple like this is a great way to expose a young child to foreign languages. The main focus of the DVD was finding rhythm in every day things, but I wouldn't have picked up on that theme if I hadn't known the title of the DVD. In addition to giving you quality musical engagement for your child, Juno Baby is giving back to the community. They are very proud of their One for All project. For every Juno Baby DVD, CD or book purchased, they donate one item to a child less fortunate. Their goal for 2010 is to give away 1 million items!!! Wow!! Another fun and wonderful surprise this morning when I received an email of pictures of Kristy Swanson with one of our Juno Baby DVDs and dolls! Thank you Kristy!! Way to Go, Juno received a very thoughtful review from Flying Giggles and Lollipops earlier today. We were excited to read "Kudos to Juno Baby for making a wonderful product and for supporting a fabulous cause!" To read the full review, click "continue reading below"
Now here's a lover of string instruments! We just received this cute picture from The One Fantastical's blog writer Nina and wanted to share. Thank you for the picture! She's watching Indie's Great Teddy Bear Hunt. In this scene, Bunny and Indie sing a duet about Echos. The instrumentation of which is violin, cello, bass, clarinet, and oboe. To hear a clip, click this Orchestral Music Edition link and then go to My Echo. Well, you can imagine my surprise when I woke up this morning and checked my google alerts to find a picture of Joey Lawrence with his absolutely adorable daughter Charly and wife enjoying our DVDs and plush on the Hot Mom's Club blog! We were told that Charly loved the DVD so much that she insisted on bringing it with her on the photo shoot! Yay!